The San Francisco Bay Area, also known as the Bay Area, is a metropolitan area that goes around the San Francisco Bay in Northern California. It includes the cities of San Francisco, San José, and Oakland, and their many suburbs. It also includes the smaller urban and rural areas of the North Bay. Over seven million people live in the San Francisco Bay Area. 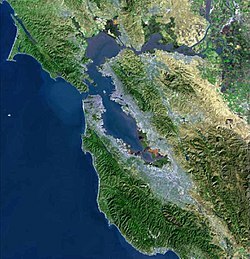 The San Francisco Bay Area is the 43rd largest metropolitan area in the world in population. The Bay Area includes cities, towns, military bases, airports, and related regional, state, and national parks. San José is the largest city in the Bay Area since 1990 and the tenth largest city in America. But for most of its history, San Francisco was the city with the most people. San Francisco is still the city people pay the most attention to, and it is the major cultural center in the region. Bay Area Rapid Transit connects the different parts of the Bay Area. 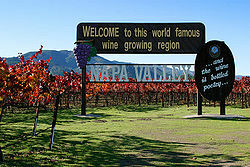 Napa Valley is most famous for its wine. The region north of the Golden Gate Bridge is known locally as the North Bay. This area includes Marin County and continues north into Sonoma and Napa counties and east to Solano County. With some exceptions, this region is quite rich: Marin County is listed as the wealthiest in the nation. The Golden Gate Bridge is a suspension bridge crossing the Golden Gate strait, the opening into the San Francisco Bay from the Pacific Ocean. It connects San Francisco with Marin County. The City and County of San Francisco is generally placed in a category by itself in terms of geography and culture. It is separated by water from the north, west and east, and by a county line from its neighbor cities to the South. San Francisco has been the cultural, financial and urban center of the region for a long time. For most of the Bay Area's history, it has also been the main population center. But because the size of the county is limited, the growth of the city was limited as well. As a result, other cities and counties have had more population growth. The area between the South Bay and the City and County of San Francisco is the San Francisco Peninsula, known locally as The Peninsula. This area includes many small cities and suburban communities in San Mateo County and the northwestern part of Santa Clara County, as well as several towns along the Pacific coast, such as Pacifica and Half Moon Bay. 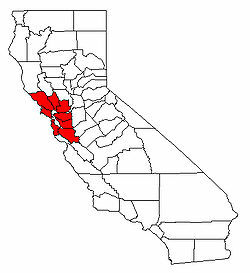 The eastern side of the bay, consisting of Alameda and Contra Costa counties, is known locally as the East Bay. The East Bay is split into two regions, the inner East Bay, which is on the coast of the Bay, and the outer East Bay, including the inland valleys separated from the inner East Bay by hills and mountains. Berkeley as seen from the Claremont Canyon reserve. The large tower in the center of the photo is on the campus of the University of California, Berkeley. The communities along the southern edge of the Bay are known as the South Bay, Santa Clara Valley, and Silicon Valley. This region is home to a large number of major technology companies. Some tech companies in the South Bay are Intel, AMD, Cisco Systems, Hewlett-Packard, Apple, Google, and Yahoo!, Microsoft and much much more. The San Francisco Bay Area is one of the wealthiest regions in the United States. ↑ "Pleasanton tops county in median household income". Inside Bay Area. Retrieved 2006-10-15. San Francisco Housing and Real Estate Guide Aggregates the collective knowledge of the San Francisco real estate community. San Francisco Bay Area Boat Launch map A collaboratively edited index of public boat launches helping to develop a water trail network. This page was last changed on 9 March 2015, at 04:02.